The Capuchin Monkey, Cebus capucinus, is a New World monkey that is found mostly in Brazil but also inhabits other parts of Central and South America. The capuchin are active during the day searching for food up in the trees and only going to the ground for water when needed. At night, they will wedge themselves among the branches to safely sleep. They do live in large groups up to about 40 members. please call me ! What to see if he is going to good home. Please call me! 256 2062097 Gorgeous and looks like a silver back ape. I have had since a baby. I hate to to sell but moving into senior living and they are not to cool about excotic's. 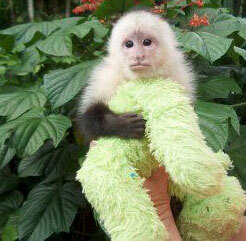 The Capuchin monkey does have a varied coat color among each species. Fur colors are variations of black, brown and creams. The face color is white to pink. Their body length is 12-22 inches long with a tail length just about equaling the body length and will weigh from 3 to 9 pounds. The tail is prehensile so it is used to wrap around branches while they move and jump in the trees. A capuchin can jump to 9 feet high! The diet in their native habitat is a variety of fruits, vegetation, nuts, insects, amphibians, eggs and small birds and mammals. It has also been known that capuchins will go down to the water ways and catch crustaceans which they will crack open the shells using rocks. Monkeys are not a good pet for many people. One should learn as much as they can along with talking to current monkey owners before bringing one into their home. Also many states do regulate pet monkeys and some ban them altogether. Please check with your local and state to make sure you can have a monkey and if permits are needed. 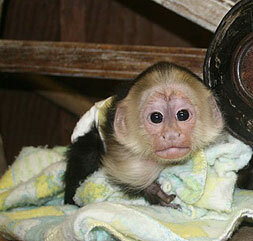 Capuchin monkeys can live up to 50 years old. Something else to consider before purchasing one. 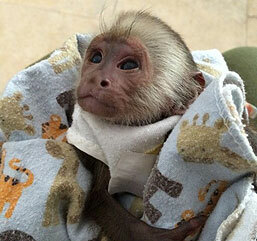 Capuchin monkeys are the most intelligent of New World monkeys. This can make them challenging to keep as a pet. They have to have a lot of enrichment in their lives. Since they are social species, they need a high amount in interaction with their owners or other monkeys. Caging requirements is the larger the better! Having an outdoor enclosed area is also recommended as so your monkey can get out in the fresh air and enjoy the elements. Some states may have a required caging size that is needed for each monkey so don’t forget to check into that. It is best to provide many toys and enrichment items that are safe for the monkey to play with even when not being watched. There are a few dry food diets that are made specifically for primates. Mazuri and ZuPreem are 2 most popular brands that are used in zoos across the world. They also sell canned wet food for primates.